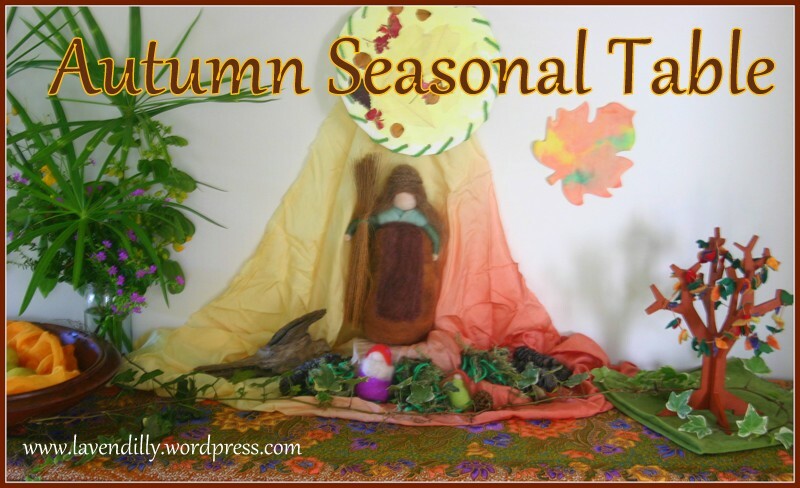 It has been a while since I’ve had a seasonal table. We set one up for Advent, Christmas and the Summer Solstice but then we moved house and just didn’t make a place for it. It has felt a little like something has been missing in our house – a reverent space to honour transitions. So I took care of that today!! Mother Earth has come out to watch over our home. 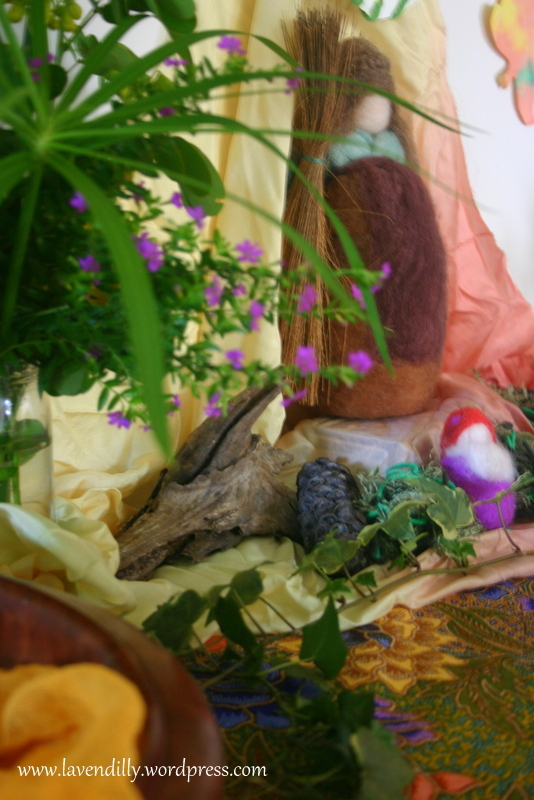 This month I have been working a lot with the impulse of Hestia, and I find her in Mother Earth this season, standing there reassuringly with her broom, ready to welcome people into our home, keep good energy flowing in and out of our front door, and to sweep away the cobwebs, keeping our home fresh and clean. Autumn is a subtle seasonal shift in Queensland. We don’t get blazing red and gold leaves on our trees, only some in the colder parts of the hinterland. In fact some of our native trees produce new leaves this time of year, but they are baby soft and red before they mature so we still get colour. We have grevilleas flowering, golden cassia creeping through the gardens and roadsides, and golden panda flowers exploding from their branches. Leopard trees have the last of their big bright orange flowers, and birds of paradise parade their golden and purple plumage too. We have colour in Autumn, but it is the colour of life, not the colours of transition to winter. I like my seasonal tables to reflect this energy too. Apart from some traditional autumnal decorations made by my daughter, this seasonal table is still very green, very floral and flowing in abundance. 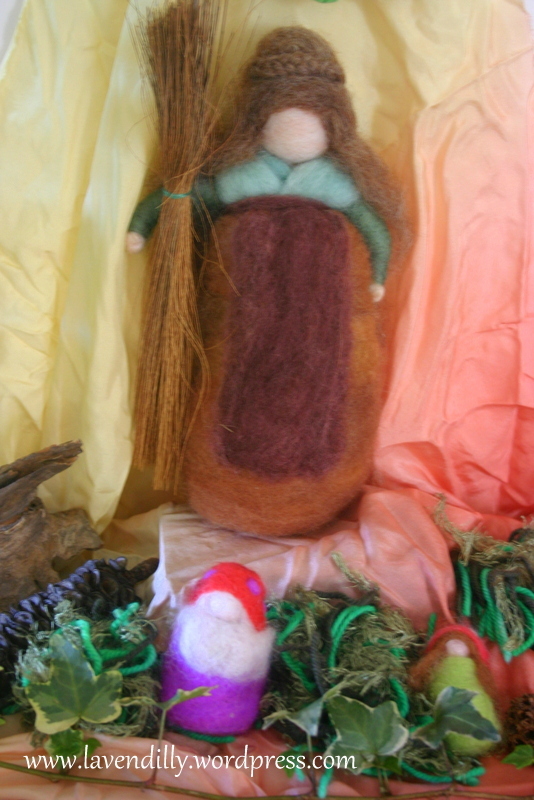 A bowl of seasonal fruit is present as an offering (although some of it is felted, so choose your fruit with care!). Flowers and foliage from our garden, and nature spirits – we have mushrooms popping up everywhere, but these are a lot brighter than the brown and grey stems in our moist garden. 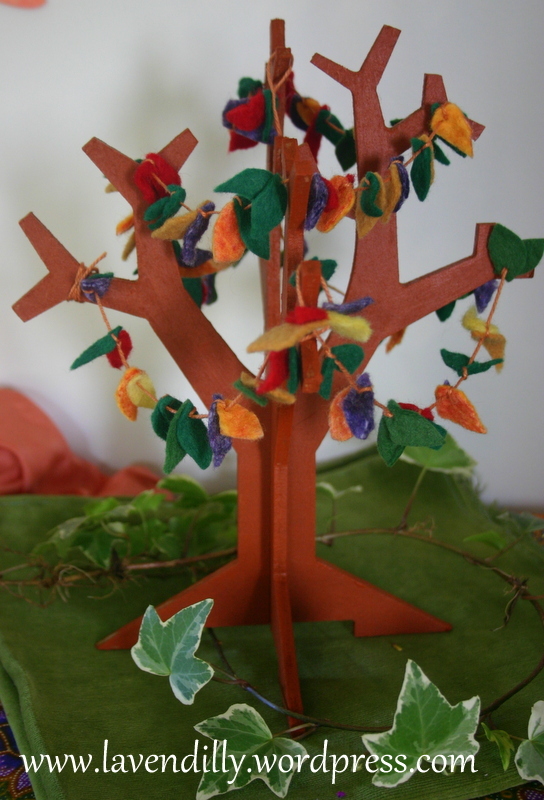 And our tree is adorned by a string of colourful leaves. I will change this mini leave garland with the seasons. I think we may hang some little fruit from it too – a magical tree that produces all seasonal fruit at once! Pears, apples, limes, persimmons … wish I had a tree like that in my yard! !